The phenomena discussed on these pages have many overlaps with those UFO incidents that remain “unexplained”. Both the official French (GEIPAN) and British MoD Defence Intelligence Staff studies prefer to use the acronym UAP – Unidentified Aerial Phenomena – in preference to UFOs. They recognised that in most instances there is no actual evidence for the presence of a physical flying ‘object’ (a flying saucer). The British MoD Condign report on UAPs, completed in 2000, concluded that the majority of ‘unexplained’ UAP sightings could be accounted for as observations of natural and man-made phenomena (including Black Project aircraft). But the author was unable to fully explain a small residence of incidents that he attributed to “natural but relatively rare and not completely understood phenomena…occurring in the atmosphere, mesosphere and ionosphere” (for a summary of the content click here). Three examples mentioned in the report include ball lighting, earthquake lights (earthlights/spooklights) and other plasmas. 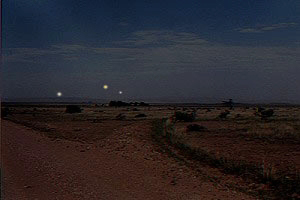 Other UAPs may have a more prosaic explanation – as unusual meteorological phenomena such as parhelia (sundogs), mirages and refracted light from ground sources such as car headlights and lighthouse beacons, as in the case of the Durham false lights. One celebrated ‘UFO’ incident – the lights seen by USAF airmen in Rendlesham Forest, Suffolk, during December 1980, could be accounted for in this way. In March 2002 I received a fascinating first-hand account from Charles V. Metz, 1st Lieutenant, USAF, 512th Fighter Interceptor Squadron, of UAPs he observed whilst stationed at RAF Bentwaters, Suffolk, 1955-57. 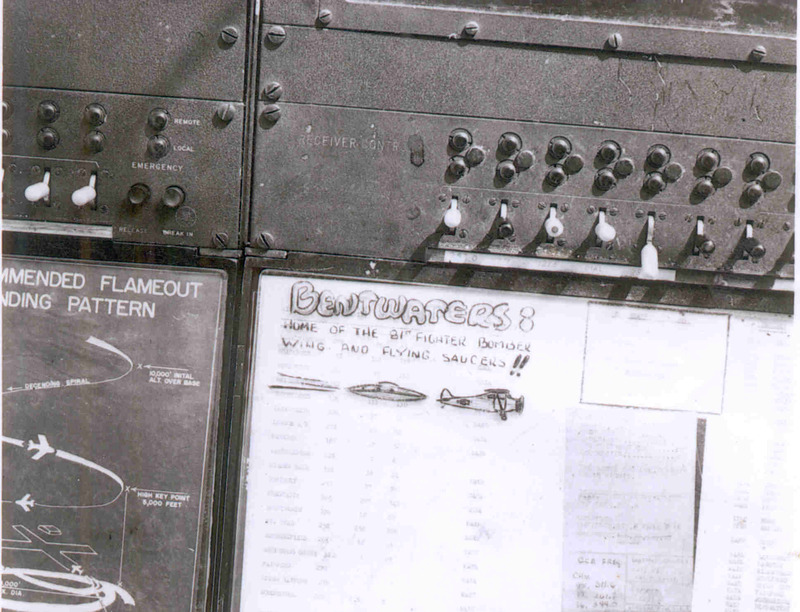 Metz was one of the two T-33 pilots who were scrambled to investigate UAPs that were spotted by the base GCA radars during the famous ‘UFO’ incident on 13/14 August 1956. He was familiar with the sightings of “unexplained lights” reported by Lt Col Charles Halt and other airmen in the Bentwaters/Woodbridge area during 1980 and felt his own observations might provide the answer. “… The UFO became a very familiar event for us at Bentwaters during our three year assignment there. I have a pretty good memory of a number of UFO sightings and of trying to chase one night. We really were a bit disturbed about some of the things we sighted until the sightings were explained. I will relate a couple of the more significant events to you and you can judge for yourself what we concluded. “A few background items that will help you understand why I came to some clear conclusions are in order I feel. First, I have a degree in engineering as a result of college in the late 1940 period of my life. Second, My technical skills are pretty sharp as was demonstrated in later life as a System Engineer in the area of designing, building and testing large satellites used for intelligence gathering. Third, I am and always have been interested in the so called UFO sightings. I read and watch TV programs on UFO sightings and other strange things that seem to happen. “Bentwaters AFB had UFO sightings that really kept us excited for weeks in 1956. The event that really started the whole thing consisted of a phone call from the tower operator asking us to take a look at the strange lights that were “floating” on front of the tower. “It was early evening and there were only a few of the pilots in the ready room so we all ran out to the tower to see what was happening. I have to say that there were strange glowing balls of light floating in front of the tower. They would float slowly by the tower and then seem to ascend slowly to about 500 feet and cease to be visible. As we stood there we next saw some more light balls floating down the runway from the North end of the runway and do the same thing. We watched this happen for perhaps 20 minutes. It was very easy to let yourself get pretty excited and so we called our GCA and asked them if they say anything. My memory says that they could not find anything on their screens but that they did sight them when they went outside . 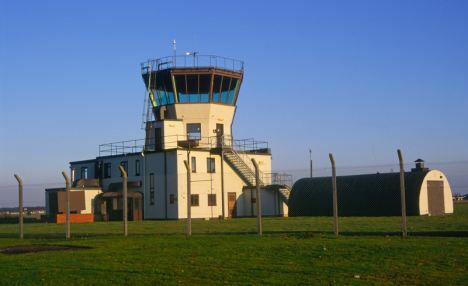 Their view point was from the East side of the runway slightly to the South of the tower. We were all dumbfounded by this activity. After about 20 minutes the frequency of sightings seemed to decrease to a point of none for 15 minutes and then two balls would appear and do the same thing. After standing in the chill evening air we finally retired to the O Club for a few drinks and talk about what we had seen. “At this point I should relate the weather conditions. It was cool and very damp with a light fog in the air. The night was clear of clouds. “This strange happening was seen on several nights during the next few weeks. Always the same direction and pattern seemed to be the order of things. Some times there were a lot of sightings and other times only a very few. Spooky to say the least. “Sounded like a winner to me so we tested the theory and guess what, that was the source of the UFOs. “Testing was easy but it was not easy to find the proper conditions and we waited a long time to get a sighting that would allow us to test. When the time arrived we drove down the road toward the runway while observers were standing around the tower. As we descended the high ground North of the runway we would turn the lights off and on for a distance of about a half mile just before the road turned West. Yep, you guessed it. The observers say our lights blink off and on but only by watching the floating balls of light as they drifted by. That was enough for me to say the we had found the source of our ‘Bentwaters UFOs’. “True [during the 13/14 August 1956 UFO incident] Andy Rowe and I did look all over the place from the vantage point afforded us from the T-33. We saw nothing of course. Had we have made a Northerly approach to land we might have seen the ‘UFOs’ but the phenomena was not ‘on’ when we landed. I later concluded that the event was again due to strange weather conditions that resulted in lights that were not where they seemed to be. That is about all I can say about that particular event. “There was a third event that occurred early one evening some time doing this period of sightings. It consisted of a strange bright light that seemed to be directly East of the Base and was acting sort of oddly. I scrambled in an F-86 and went out over the North Sea chasing it. I used afterburner in the climb and the ‘thing’ just ran off and left me. As I broke out of a layer of poor visibility at about 25,000 feet I finally got my mind to see what was really out there and make the decision that there was no way to ever catch up. It was a nice big star that sure had me going for a few minutes. At about 30,000 feet I reported the star and came home. Just goes to show you that you can really get fooled visually by lights that are effected by water vapor in layers of air. I felt a bit foolish after I returned from that one. “There you have the information of the only UFO sightings that I know of during 1954 through 1957. I suspect that there have been many others who thought they were being attacked by strange flying objects that moved in impossible ways at impossible velocities. “Andrew Rowe died in the early 1970s so is not around to confirm what I have told you and I can’t think of any other specific pilots who were there and viewed what I viewed. I belive the conclusion the mod on uap was they were not a threat to uk airspace. they are then saying that they do exist but not a threat.also to conclude they are not a threat confirms they exist.